Sky will launch 3D TV channel in April | What Hi-Fi? The plan is to make Sky 3D available to all Sky+ HD customers with a wide range of 3D content covering films, sport, documentaries, entertainment and the arts. Sky 3D will work with all existing Sky+ HD boxes and will initially be introduced as a bonus at no extra cost for customers who subscribe to Sky's top subscription package and the Sky HD pack. Of course, customers will need to buy a new 3D-ready television to take advantage of the service. Sky says its 3D channel will be compatible with all 3D-Ready TVs coming to the UK and Ireland this year, including models from Sony, Samsung, LG and Panasonic. Gerry O'Sullivan, Sky's director of strategic product development, says: "2010 is the year for 3D TV. People have already embraced 3D cinema and because Sky's 3D service uses the same kind of technology, we're confident there will be demand for sports, movies, concerts and drama in 3D." As a precursor to the launch of 3D TV, Sky will broadcast the clash between Arsenal and Manchester United this Sunday (January 31st) in 3D at selected pubs around the country. The Premier League match will be filmed in 3D and broadcast in nine pubs located in London, Manchester, Cardiff, Edinburgh and Dublin. They've been kitted out with some of the first 3D-Ready TV sets in the country, supplied by LG. But Sky is not releasing details of exactly which pubs will show the game in 3D as "we need to manage demand and ensure the pubs' regulars get to see the match," says a Sky spokeswoman. LG's 47in LD920 TVs will be used for Sunday's 3D broadcast, and customers will be supplied with passive glasses to view it. 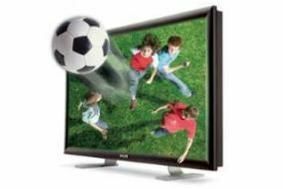 The LD920 3D TV will be on sale in the UK from April. "LG is committed to making high-quality TV more accessible and this initiative with Sky does just that," says Stephen Gater, head of marketing, home entertainment LG UK. As 3D TVs become more widely available, Sky will roll out its 3D channel to hundreds more pubs from April. Sunday's game at the Emirates Stadium will be covered in two feeds, one for Sky's HD channel, one for the 3D one. Eight specially-engineered 3D camera rigs will house 16 of Sky's high-definition cameras, to provide comprehensive stereoscopic coverage from all angles. The 3D broadcast will be supported by Sky's dedicated 3D production team and a purpose-built 3D outside broadcast truck, which will enable live mixing between camera positions, slow motion replays and the use of 3D graphics. There will also be a dedicated commentary team to support the 3D edit. Read our related stories on Sky 3D.